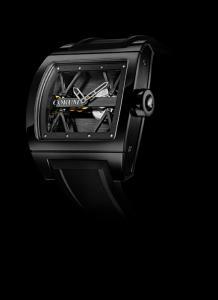 Among a selection of forty timepieces, which had already been chosen from a first round selection of more than a hundred novelties launched on the Swiss market between September 2008 and December 2009, the jury has awarded our Ti-Bridge with the Second Prize for the Watch of the Year 2009 award. This competition, organized by Ringier Romandie and Montres Passion magazine, is an essential event of the watch sector. Elected under conditions of total impartiality by renowned jury members, made up of professionals from the watchmaking industry, the Ti-Bridge confirms its reputation in the watchmaking world. Beside Vacheron Constantin’s model «Historiques American 1921», the First Prize winner, the Ti-Bridge stands out among the major references. This award is an important acknowledgment for our brand and a recognition of the repositioning strategy initiated in 2005. With the exclusive caliber designed, developed and assembled in-house and encased in the Ti-Bridge, Corum confirms its watchmaking expertise in high-end movements.